Every Galaxy S8 that flies off the production line costs Samsung an eye-watering $307.50, which includes the price of materials and manufacturing, reveals an estimate released by renowned analytics firm IHS Markit on Thursday, April 20. For comparison, that’s $82.70 more than the iPhone 7 and $52.40 more than its predecessor, the Galaxy S7. It’s hardly difficult to see why the Galaxy S8 (no figures were provided for the Galaxy S8+) is an expensive device to manufacture. At the end of the day, a quality product rarely comes cheap — and this is a prime example. The handset’s innovative design, gorgeous display and beefy internals all bump up the basic manufacturing costs and bill of materials quite considerably. Yeah obviously it cost more to make, that’s why its $80 more expensive. This reason for the s8 to be lumped with 4gb memory? In these costs are not included research and development, software costs, patent fees, marketing, transport, distribution and sales commisions. The S8+ costs likely around 327$. Yeah, if you buy them from a store. But Samsung dosent buy 1 at them time. When they order components, they buy a huge amount. So the cost will prob only be 50-100 dollar per phone, for samsung. not even close. 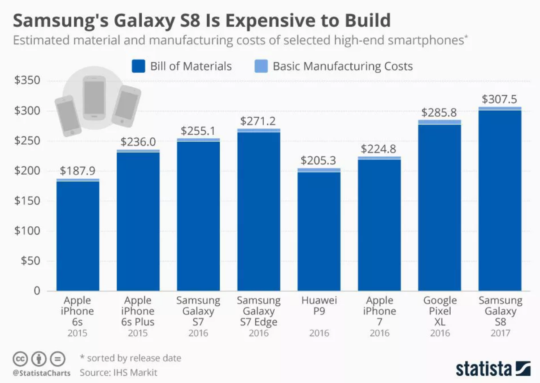 IHS Markit use standard industry supply costs and rates, so whilst Samsung will likely have negotiated a bulk discount with their suppliers, I doubt it is more than 10% than the price listed. The cost is nowhere near $50-100 per phone. Plus, as HOMER66 notes, this doesn’t include the R&D, licensing and distribution costs which would be pretty substantial for a phone like the S8. Well i know what i costs for a danish companey, when they buy componets and trust me, you will get a much lower price, when you buy alot and you said only 10%. You make me laugh, with that low % you came up with. I only talk about the phone and not resarch and etc. You cant compare 1 units price, when they buy to 3-5.000.000 units. If a company only would give you 10% discount, they will shut down fast.